Arthur Sullivan; Bob Chilcott; Boris Ord; Christmas Traditional; Felix Mendelssohn; Franz Grüber; Harold Darke;... Fine. In fine packaging. The Choir of King's College Cambridge-Favourite Carols from King's-The Choir of King's College C by The Choir of King's College Cambridge. Arthur Sullivan; Bob Chilcott; Boris Ord; Christmas Traditional; Felix Mendelssohn; Franz Grüber; Harold Darke;... Very Good. In very good packaging. 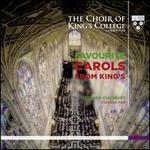 The Choir of King's College Cambridge-Favourite Carols from King's-The Choir of King's College C by The Choir of King's College Cambridge.